Conference takes place annually at the Southwest College of Naturopathic Medicine in Tempe, Arizona and featured herbs for inflammation, subclinical hypothyroid, childhood asthma, prevention of osteoporosis, radiation protection, oxidative damage, eye conditions, Parkinsons, Alzheimers, non-alcoholic fatty liver disease, lung cancer, chronic viral conditons, autoimmnue disease, chronic neck and back pain, hypertension and first aid. Also included medicine making talks and a panel on aging. The printed book of lecture notes is available externally from Amazon.com. 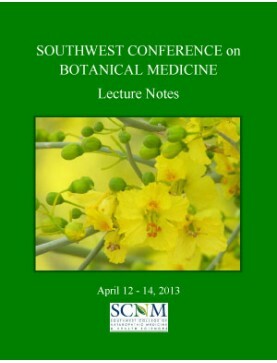 2013 Southwest Conference on Botanical Medicine: Conference Book.Order download of PDF file on this ..
Speaker: Paul Bergner. Chronic inflammation underlies many of the common chronic conditions see..
Speaker: Ryan Drum. Continued from Part 1: Catalog number 13SW26 ..
Speaker: Ryan Drum. Living on an island in Washington State far from medical help can make for some ..
Speaker: Mary Bove. Describes the atopic (allergic) child and how to control the cell-mediated ..
Speaker: Eric Yarnell. Case studies illustrate herbal formulas useful in adjunctive therapy for orga..
Speaker: Martha Burgess. Traditional uses of the widespread mesquite tree include the use of the see..
Speaker: Jason Miller. The TCM concept of Liver Stagnation describes the connection of the live..
Speaker: Mary Bove. Botanical and other naturopathic alternatives to pharmaceuticals for pain, ..
Speaker: 7Song. A primer of common first aid conditions includes a materia medica of herbs to use fo..
Panelists: Jason Miller, Kenneth Proefrock and Mary Bove. : Jason Miller discusses the neurophysiolog..
Speaker: Mona Morstein. Diagnostic criteria, statistics, symptoms, labs for NAFLD are presented..
Speaker: Eric Yarnell. Explores how the kidneys contribute to blood pressure regulation, how to choo..
Speaker: JoAnn Sanchez. An exploration of the plants in the SCNM herb garden and how to harvest and ..
Speaker: Paul Bergner. This 2013 update on subclinical hypothyroid includes a thorough discussi..
Speaker: Jason Miller. A discussion of the physiology of the cellular respiration system: oxyge..
Speaker: Rhonda PallasDowney. Uses of yerba mansa as an extract for inflammation of the mucous ..
Speaker: Mary Bove. Prevention strategies include evaluation of diet, lifestyle, family history..
Speaker: Ryan Drum. Discusses radiation exposure sources and pathologies, and the use of seawee..
Speaker: Eric Yarnell. Continued from Part 1: Catalog number 13SW01..
Speaker: Eric Yarnell. The major causes of kidney disease are reviewed with relevant symptom pi..